Handel's Messiah Sing-In, National Chorale. BOTTOM LINE: The sing-along offers a joyous opportunity to welcome in the holiday season with song while enjoying a showcase of talented choirs and soloists. This past Tuesday I attended, with some trepidation, a sing-along of George Frideric Handel’s Messiah, an oratorio of which a song or two is usually sung at most church services honoring Christmas. 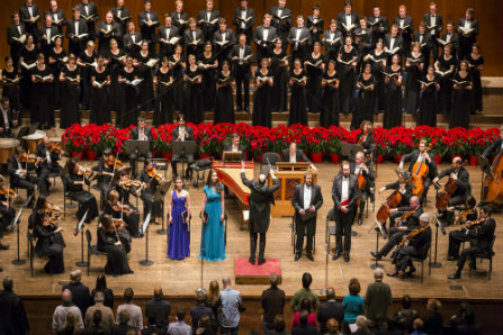 Yet when performed in its entirety, Handel’s Messiah is a powerhouse of dramatic vocals and organs turning biblical story and verse into its own intense work. Handel created the entire score in just 24 days in 1741, having been first performed in Dublin, Ireland. That marathon sessions led to its quick creation makes strangers (the audience) singing it all in one evening, without prior instruction or practice, a fitting way to honor its composer. The soloists—Jessica Sandidge, Eric Brenner, Roderick George, Kevin Maynor, and Timothy Brumfied—gave emotionally charged performances, fully conveying the tone of each song. Sandidge, in particular, has an impressive soprano voice singing in an almost operatic style. Brett Karlin, a conductor from Florida, added warmth and humor to the evening, and asked the participants to introduce themselves to those around them before continuing on with singing the chorus. As someone only familiar with the work in piecemeal, I was a bit at sea with trying to follow along and stay up to speed with the more seasoned attendees who seemed to slip into their parts without any instruction or forethought. I had downloaded the entire score online and brought it loaded onto my tablet; while I was initially able to follow along for the first few choruses, the ensemble seemed to be using a different edition. It seems that purchasing a specific edition of the score is necessary in order to fully participate. However despite our confusion, my friend and I thoroughly enjoyed having the opportunity to sing together with strangers and partake in the beautiful music surrounding the holiday season. Especially for those who may not embrace organized religion, singing together offers an opportunity to unite with others through the shared enjoyment of music. As my friend and I made our way to the subway, we broke into song, reveling in the pure joy of singing in unison. Messiah is by George Frideric Handel. Artistic Direction is by Everett McCorvey. Featured soloists are Eric Brenner, Roderick George, Kevin Maynor, Jessica Sandidge, and Timothy Brumfied.